Ads are one of the last ways to click out of Facebook. The social network is trying to eat the Internet to keep you from ever leaving. Meanwhile, businesses know it’s tough to persuade you to interrupt your social experience by opening one of their ads. Today Facebook rolled out Instant Articles to all iOS users and launched an Android beta. But news publishers aren’t the only ones Facebook wants to load inside, rather than outside, its app. At first Facebook called them “Immersive ads” and then the “ads canvas”, but really, they’re the paid promotional equivalent to its hosted organic initiative Instant Articles. That’s why I’m calling them Instant Ads. Essentially, Instant Ads are in-feed Facebook mobile ads that when tapped, immediately unfold a rich media marketing experience within Facebook’s app rather than forcing people to wait for a mobile browser page to load. Inside, these Instant Ads can sport animations, carousels, product catalogs, and tilt-to-view images. These data-heavy features might normally take so long to load in a browser that people would ‘x’ out before they appeared. The same rhetoric behind Instant Articles makes even more sense when what the user is waiting for is a paid ad rather than organic content from The New York Times or National Geographic. Instead of penalizing users for opening ads by interrupting their social experience with a slow-loading mobile website, Facebook pre-caches the marketer’s content so it appears immediately when users tap. That allows advertisers to include more engaging multimedia content that actually holds people’s attention. For example, an Instant Ad I recently spotted from fast-food chain Wendy’s unfolded to reveal a bevy of rich media related to its burger. I could tilt my phone to scan across its mayo-laced bun, swipe through photos of onions and pickles, and watch an animation of someone drawing with ketchup. It might sound silly, but it makes you feel like you’re actually holding a Wendy’s burger. That’s quality institutional brand advertising, and it never required me to leave Facebook. The brand lift already happened. Only if I want to use a store locator would I need to click a link at the end of the Instant Ad to visit Wendy’s site. In that way, Instant Ads aren’t unlike tv commercials. They’re so vivid that you just need to watch for them to be effective. Facebook hasn’t been too flashy heralding Instant Ads. It unscooped the press by quietly telling a few outlets about them in September, but never published its own announcement. Last week it briefly mentioned them in a broader blog post about shopping features. But they’re a much bigger deal than that. Instant Ads epitomize Facebook’s ad strategy, which is about making the result of online marketing some kind action taken or emotional impact, rather than a short-lived click to a website. 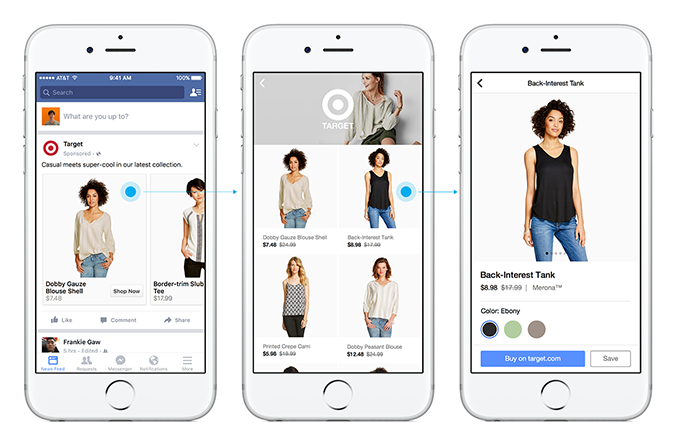 Facebook now has Buy buttons that let you purchase products you see within feed ads with your credit card on file so you never visit a merchant’s site. Its newest ads offer sign-up forms that are great for lead generation and plug right into a business’ CRM like Salesforce. For the user, it’s a bit like being put in a pinball machine. Facebook earns points as long as you’re still rattling around inside, running into friends’ photos, native videos, and Instant Articles. Facebook loses when you slip out of its app through the few remaining holes. And Instant Ads are like an extra set of flippers, bumping you back inside when you were about to leave. Sometimes that means you don’t spend your quarters anywhere else. Instant Articles pose a serious risk to news and content publishers who lose the relationship with their audience that leads to loyal readership and subscriptions. But for the user, a Facebook where you can see friends, read news, watch videos, and even experience ads without enduring crappy mobile load times sounds like more fun. Play on, Zuck.